The 2019 Tour of Tassie will see 30 riders from across Australia start in Launceston, head to Cradle Mountain and then to the northern and eastern coastlines of Tasmania. The 1000km ride culminates in the gruelling climb of Mt Wellington in Hobart. The two are very fortunate to be undertaking this challenge together as mates. Joshua Burgess (Class of 2008) and Adrian Stroh (Class of 2007) have been friends since school. Although in different year levels they played soccer together and socialised a lot in the same circles. Adrian says that they even bonded over both having parents (Di Fitzpatrick and Phil Stroh) teach at Radford whilst they were students! It wasn’t revealed whether this was a good or bad thing. Although money for the canteen is an obvious upside! They both have extremely fond memories of their times playing on the soccer field. We played first 11 for the Radford soccer team together and spent many afternoons together paired up at training. Adrian says one of his favourite memories is when Josh was teaching the team his dance numbers from the school musical Joseph and the Amazing Technicolor Dream Coat and then turning it into their weekly soccer warm up. Friendships must be pretty strong if you can rock up to soccer training and are prepared to help a mate rehearse for the musical with enthusiasm and good humour. 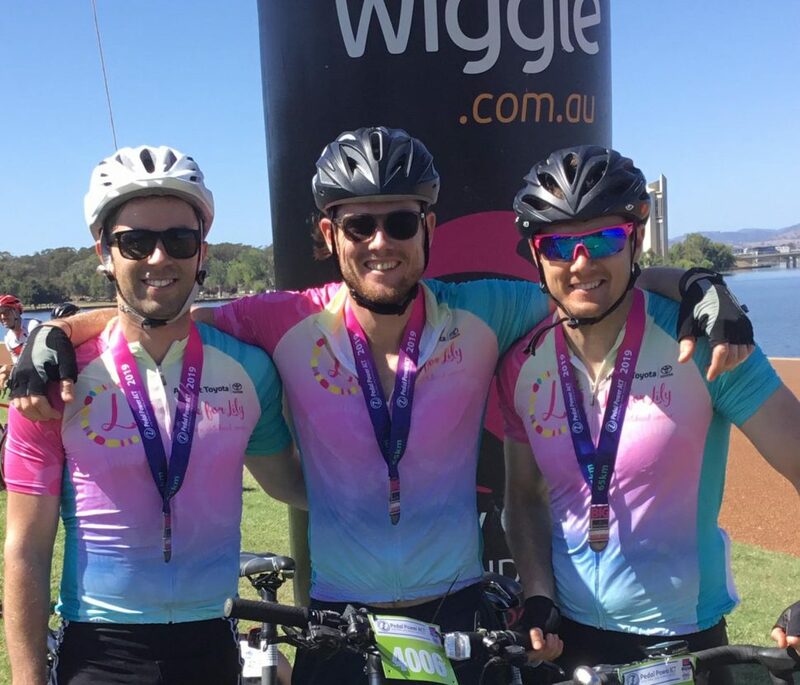 The two have stayed mates and Joshua has become extremely passionate about the Live for Lily Foundation which was set up in memory of Lily Hester who lost her battle with cancer in 2014, aged 9. Live for Lily raises awareness and funds that will go directly towards research that is dedicated to finding a cure for childhood cancers. The major fundraiser is the Ride for Lily. It sees riders ride epic distances such as Coonawarra to Melbourne, Sydney to Melbourne, Ride to the Rock and this year the Tour of Tassie. The 2019 Tour of Tassie will see 30 riders from across Australia start in Launceston, head to Cradle Mountain and then to the northern and eastern coastlines of Tasmania. The 1000km ride culminates in the gruelling climb of Mt Wellington in Hobart. You can see the map, rider profiles and donate here. 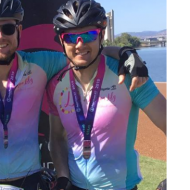 As a veteran of the ride now, Joshua wanted to get more Canberra riders involved in the organisation as most of the riders are from Victoria so he asked and threw his mate the fitness challenge. Adrian happily put his hand up and came on board. Adrian says that they were both very strong long distance runners but noted that was when they were much much younger and fitter! They are both looking at this as a personal challenge. The challenge in raising money for the foundation, the challenge of being a good ambassador for the goals of the foundation and the challenge of pushing through the sweat and tears or whatever else the road (our path in life) throws our way. Joshua says ”the physical challenge of training and 7 days of solid hill climbing are nothing compared to what a child going through cancer and their family must endure. That is always top of the cyclists’ minds and the reason why the team is riding, to raise funds to end childhood cancer. Adrian says that they are very fortunate to be undertaking this challenge together as mates. Adrian is grateful for the programs he took part in at Radford, where he developed his compassion and kindness especially throughMr Huitker’s TeamSUPPORT initiatives such as visitations to nursing homes to share stories and give company to the elderly. Joshua says that Radford’s values of truth, compassion and wisdom stay with you for life. It is a motto that you can live by and you can teach and communicate Radford’s values easily to friends and family with your actions everyday. To keep track of the cyclists’ journey, follow Live for Lily on Facebook and Instagram (live4lily).